In the firing line . . . Ged Rathbone, Trevor Swales and Carl Johnson. Panthers chief Ged Rathbone has vowed to given an honest answer to any question thrown at him during a fans’ forum next week. The promoter, who recently announced he will remain at the helm for 2017 after considering his future in the sport, will face supporters at the Post Office Club on Tuesday (October 11). And he is hopeful of a big turnout for the 8pm event at the Bourges Boulevard venue, which has free admission. Rathbone said: “I pride myself on being as open and honest as I possibly can with the supporters. “The club has not laid on a fans’ forum since last winter and this is the perfect time to put that right. 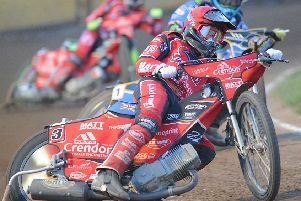 Rathbone will be joined on the top table by co-promoter Trevor Swales and team boss Carl Johnson when donations to the Peterborough Panthers Speedway Supporters Club will be welcomed.